Abyss: Fixed issues on Windows with double borders and white space above toolbar. Color Schemes: Use foreground color for caret color. Commando: Cache is not updated when a shorcut is added. Commando: Commando hangs when descriptions have complex values. Commando: Commando prompts are behind commando panel on OSX. Commando: Oversized menulist icon on HiDPI. Commando: Reload sections scope when switching files. Editor: XML Auto-indentation causes infinite loop in edge cases. Icons: Debug tab icon was oversized on HiDPI/Retina. Notify: Pressing cog hides notification when priority is NOW. Places: Duplicate contents when toggling a folder. Places: Update places when a project is saved. Printing: Use the global ko object. Run: Run command was not saving recent commands. Trackchanges: Encoding issue on windows where characters end up garbled in the change dialog. UI: Bottom pane height did not persist properly across restart. UI: High CPU use on OSX when using Trackpad. UI: Improve scrollbar contrast on dark color schemes. UI: Places widget dropdown menu had uppercase text. UI: Ugly border showing around notifications on windows. UI: fixed OSX Yosemite vibrancy effect in panes. fix Debugger: Required two attempts to start debugging. Debugger: Ensure Ctrl+F5 to skip debugger dialog works. codeintel: allow go-lang prefs to pass to out-of-process codeintel. Tcl autocomplete insertion was incorrect for unicode. Code Intelligence: Fix race condition when multiple windows opened at startup. 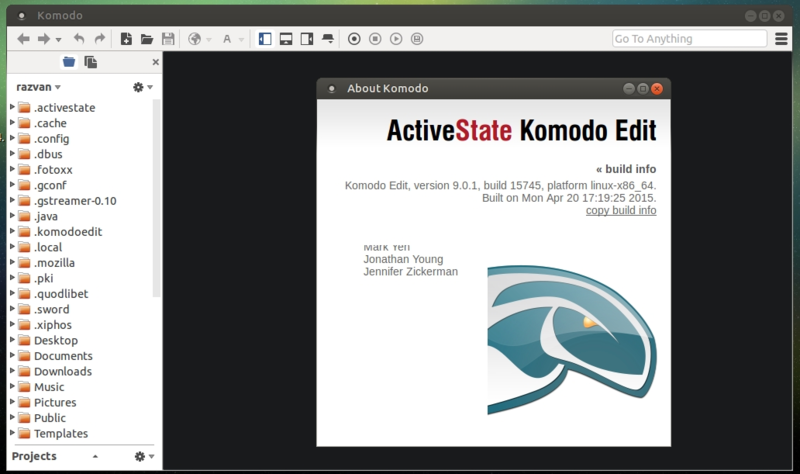 In this article I will show you how to install Komodo Edit 9.0.1 on Ubuntu 15.04 Vivid Vervet, Ubuntu 14.10 Utopic Unicorn, Ubuntu 14.04 Trusty Tahr, Ubuntu 12.04 Precise Pangolin, Linux Mint 17.1 Rebecca, Linux Mint 17 Qiana, Linux Mint 13 Maya, Pinguy OS 14.04, Deepin 2014, Peppermint Five, Elementary OS 0.3 Freya, Elementary OS 0.2 Luna, Linux Lite 2, LXLE 14.04 and other Ubuntu derivative systems.